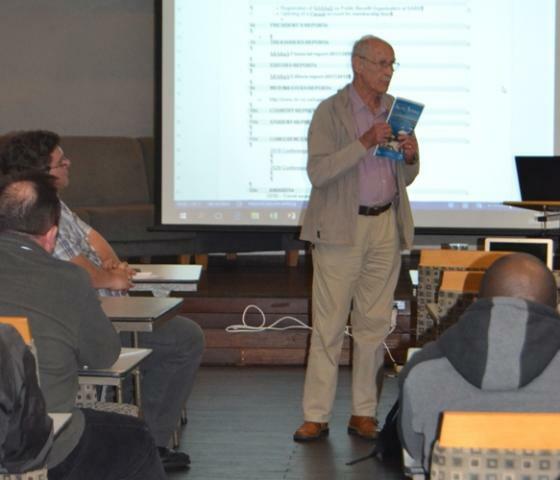 Mike Coke, Honorary Editor of the African Journal of Aquatic Science (AJAS), was awarded the Southern African Society of Aquatic Scientists (SASAqS) Silver medal. The medal is awarded irregularly in recognition of the exceptionally high standard of a particular contribution to the management, conservation or development of aquatic ecosystems or resources. The journal, originally known as the Journal of the Limnological Society of Southern Africa was published as a bi-annual publication from 1975. In 1989 the journal underwent a name change to the Southern African Journal of Aquatic Sciences and in 1998 Mike Coke took over as Honorary Editor from Prof Brian Allanson. Within one year the journal went from a publication, which was produced on a desk top PC in WordPerfect, to one of the new journals in the professional publishing space under the National Inquiry Services Centre (NISC). The journal also got an international flavour with a name change to the African Journal of Aquatic Science in 2000. Under Mike’s editorship the manuscript flow increased significantly from 30 in 2001 to well over 180 at present. In 2007 the journal increased the number of issues per year from two to three and was included in the Science Citation Index receiving its first Impact Factor in 2011, which has increased to its 2017 value of 0.706. In 2009 NISC put AJAS in the international spotlight by co-publishing AJAS with Taylor and Francis. In 2013 the decision was made to increase the number of issues to four per year. In his 20 years as Honorary Editor, Mike Coke has ensured that each paper that was published in AJAS was of impeccable quality. English and non-English speaking authors alike had grammar-perfect manuscripts published. Mike’s 35 years of scientific experience as a fish biologist with Natal Parks Board meant that each paper also received rigorous scientific scrutiny. In his tenure as Honorary Editor, Mike handled 2054 submissions of which 1824 manuscripts were published. The relatively low rejection rate of 22% attests to the efforts that Mike put in to assist novice scientists to get their research published. As a parting contribution to South African science, Mike has published on a freshwater shrimp new to both South Africa and Africa,, in the latest issue of AJAS. This note can be viewed here. As a Society, SASAqS is indebted to Mike for the 20 years of unselfish service in promoting aquatic sciences locally and abroad. The journal has grown from humble beginnings to a solid vehicle to showcase aquatic sciences on the African continent.